[S1978] Ancestry.com Family Trees, online www.ancestry.com, Renee Kehoe Family Tree, Virginia Helen Behrends entry. Accessed March 26, 2019. [S2761] Ancestry.com ThruLines, online Ancestry.com, Patrick Sullivan ThruLines, accessed March 24, 2019. [S1978] Ancestry.com Family Trees, online www.ancestry.com, Benedict Family Tree, Margaret Mary Connor entry, created by Terry Allen, accessed March 27, 2019. [S2732] U.S. Department of Veterans Affairs BIRLS Death File, 1850-2010, online Ancestry.com, Lawrence Benedict entry, accessed March 27,2019 via Ancestry.com. [S2781] 1940 US Census, Illinois, Cook County, Evanston, Washington, DC, Evanston Township, Ward 6, Accessed online March 29, 2019. [S140] Chicago Daily News, November 30, 1968. [S150] Evanston Review?, June 26, 1980. [S2780] Georgia Death Index, 1933-1998, online Ancestry.com, Lawrence D. Benedict entry, registered 24 Nov 1986, certificate # 041575; accessed March 27, 2019. Biography*: Photo of Neil and Margaret Benedict at the 50 th Wedding anniversary. Death*: Neil died on 29 November 1968 at Evanston, Cook County, Illinois, USA, at age 76. Obituary 1: Neil W. Benedict, 76, of 1020 Grove St., died November 29 in St. Francis Hospital. A tool manufacturer for more than 40 years, Mr. Benedict was founder and president of the Ajax Tool Works, Franklin Park. He was recognized in his field as a specialist in the design and manufacture of hand-forged specialty tools and accessories. Mr. Benedict, who had been a resident of the Chicago area since the early 1900s was born in Bear Lake, Michign. He was married to the former Margaret Connor, daughter of the late Mr. and Mrs. Thomas E. Connor of Evanston. Survivors, in addtion to his wife, include a daughter, Mrs. M. F. Bagan of Piedmont, Cal; two sons, Neil W. Benedict Jr., of Evanston, Lawrence D. Benedict of Tarrytown, N.Y., a brother, E. Ross Benedict of Seattle, and 23 grandchildren and one great grandchild. Obituary 2: "Benedict Services in Evanston"
Neil H.(sic) Benedict, 76, founder and president of Ajax Tool Works, Inc., Franklin Park, died Friday in St. Evanston Hospital, Evanston. Mr. Benedict, 1020 Grove St., Evanston, was involved in the design and development of many tools and parts that have become standard in the oil, chemical and auto industries. He was recognized as an authority in the design and manufacture of hand-forged specialty tools and accessories. Survivors include his wife, the former Margaret Connor; two sons, Neil W. Jr., of Evanston, and Lawrence, of Tarrytown, N.Y; a daughter, Mrs. M. F. Bagan, of Piedmnot, Calif; 23 grandchildren and 1 great-gandchild. Mass will be offered at noon Monday in St. Mary's Church, 421 Oak, Evansotn. Friends may call at the Fitzgerald and Franklin Funeral Home, 1521 Maple, Evanston. Source Unknown. Neil W. Benedict, 76, founder and president of the Ajax Tool Works, Inc., 10801 Franklin in Franklin Park, died Friday at St. Francis Hospital, Evanston. Mr. Benedict, of 1020 Grove, Evanston founded the tool manufacturing firm in 1947. Before that he was vice president and general manager of sales of Arrow Tools Inc., formerly of 1900 Kostner. An Evanston resident for more than 50 years, Mr. Benedict was responsible for the design and development of many tools and parts which have become standard equipment in the oil and chemical industries. He was a member of the Michigan Shores Country Club and the National Assn. of Manufacuters. Surviving are the widow, Margaret; a daughter Mrs. Mardianne Bagan; two sons, Neil W. Jr., and Lawrence D., and a brother, E. Ross. [S141] Evanston Paper, December 5, 1968, newspaper clipping, Clipping from Evanston Historical Society, unknown newspaper. [S375] Nancy Post, "Post, Nancy - Connor Ahnentafel." [S149] Evanston Review?, July 21, 1966. [S1422] Cook County, Illinois Marriage Indexes, 1914-1942, online www.ancestry.com, Benedict-Connor marriage, Ancestry.com, accessed October 26, 2011; License number 00732661. [S141] Evanston Paper, December 5, 1968, newspaper clipping, Newspaper clipping found in Evanston Historical Society files. Newspaper unknown. [S141] Evanston Paper, December 5, 1968, newspaper clipping. A requiem mass for Neil W. Benedict Jr. is scheduled for 10 a.m. today in St. Athanasius Church. Mr. Benedict, 56, of 2252 Ridge Av., died Monday in St. Francis Hospital. He was president of Ajax Tool Works, Inc., Franklin Park since 1968. He had worked for the company since it was founded in 1946 by his father, N. W. Benedict. The company holds several patents for speciality tool designs, particularly safety retention devises for air hammers. Mr. Benedict was born in Evanston, lived here most of his life, and was a fourth degree knight with Newman-Columbus Council of Knights of Columbus. His is survived by his wife, Marian, and 11 children. They are Robert, Laurence, William, John, Marie, Ellen, Irene, Katie and Charlie Benedict, all of Evanston, Melissa Allen of Phoenix, Ariz. and Margaret Griesbaum of Detroit, Mich.
Also surviving are three grandchildren, a sister, Mardianne Wilson of Piedmont, Cal. and a brother, Lawrence Benedict of Savannah, Ga.
[S1273] Sr. Arthur T. Frank, Illinois Medical Certificate of Death. Married Name: As of 26 October 1957,her married name was Sullivan. Marriage*: She married Thomas Desmond Sullivan at Richmond, McHenry County, Illinois, USA, on 26 October 1957. Address: As of 2006, Elayne Marion Bergin and Thomas Desmond Sullivan lived at 5131 Coulter Road, Oak Forest, Cook County, Illinois, USA; US. Public Records Index Record, accessed April 4, 2006; Ancestry.com. 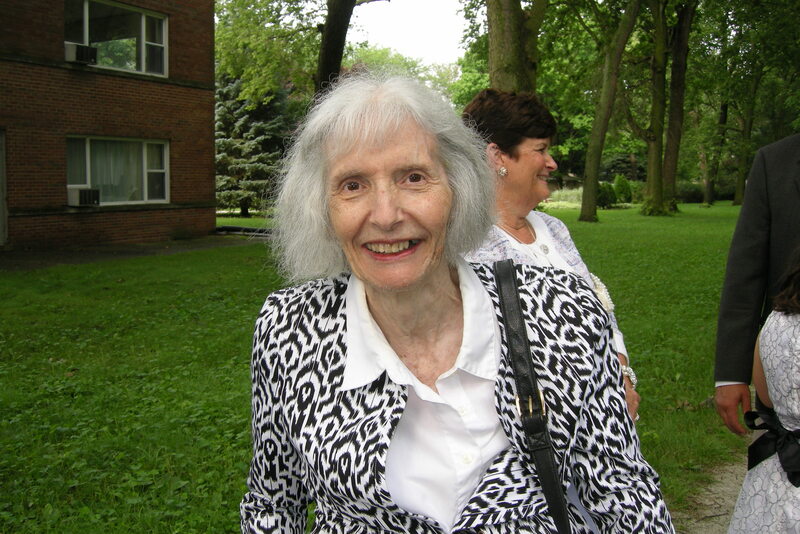 Death*: She died on 8 March 2017 at Illinois, USA, at age 91; Sullivan, Elayne M.
Elayne M. Sullivan (ne Bergin), age 91, late of Oak Forest, IL. Beloved wife of the late Thomas D. Sullivan. Loving father of Joh (Sally) Sullivan, Joseph Sullivan and William Sullivan. Cherished grandmother of John (Ashley), Stephen, Thomas, Daniel, Shannon and Lillian Sullivan. Funeral Monday, March 13, 2017 at 10:30 a.m. from the McKenzie Funeral Home, 15618 S. cicero Ave., Oak Forest to St. Damian Church, Mass 11:15 a.m. Interment All Saints Cemetery, Des Plaines, IL. Visitation Sunday 3:00 p.m. until 7:00 p.m. For information: 708-687-2990. Sign Guestbook at chicagotribune.com/obituraries. [S14] William Sullivan, "Sullivan-Bergin, Family Group Sheet." [S665] Elaine Beaudoin's personal knowledge Elaine McIntyre Beaudoin, personal files, Received a phone call today from Joseph Sullivan, son of Elayne Sullivan, saying his Mom died this afternoon. [S2479] Elayne Sullivan Burial record from kioske, All Saints Cemetery, Des Plaines, Illinois. [S1885] Ellen Bergin entry, Wisconsin, Fond du Lac County, Registration of Births, Reel 66, Page 257, No. 001666 (March 26, 1881). [S1676] Find A Grave, online http://findagrave.com, Michael Bergen headstone, St. Charles Cemetery, Fond du Lac, Fond du Lac County, Wisconsin, section 3, row 4. Information created by Steve Seim, March 23, 2011, Memorial #67307745. Accessed March 13, 2014. [S2079] Ellen Bergin, Death registration. [S1881] James Bergin entry, Wisconsin, Fond du Lac County, Registration of Birth, Reel 66, Page 257, No. 001662 (March 26, 1881). [S1676] Find A Grave, online http://findagrave.com, Michael Bergen headstone, St. Charles Cemetery, Fond du Lac, Fond du Lac County, Wisconsin, section 3, row 4. Information created by Steve Seim, March 23, 2011, Memorial #67307743. Accessed March 13, 2014. [S2080] James Bergin Registration of Death File number 01810, Wisconsin Vital Records Pre-1907.